Dry and display freshly washed utensils with Tony Holman?s hand-thrown stoneware caddy. Where are you going to put that whisk you just rinsed off? We all have jars, or mugs, or "that corner of the cabinet." 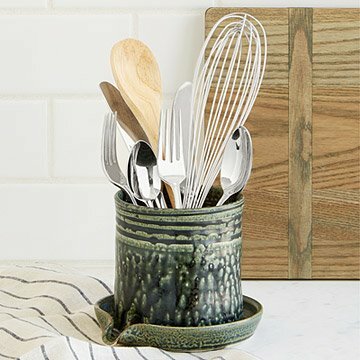 But what if your utensil holder was actually a thing of beauty that you were more than proud to display in your kitchen. Imagine using this artful caddy from master potter Tony Holman. He hand throws the stoneware cylinder and its attached saucer on his wheel, and forms a convenient spout for draining off any pooled water. He finishes it off with a wonderful, earthy glaze with rich, speckled colors. Handmade in Plano, Texas. Brilliant and beautiful at the same time! This keeps the utensils clean and dry. The fact that it is a lovely piece of pottery is a bonus! Perfect size, cute, and functional! This sits on the counter, corner edge of the sink (clean side) and it's cute and functional. It allows more space in the clean dish for dishes with it being on the counter. It's bigger than most utensil holders as well and that's a huge plus for me since we cook a lot in our household. Didn't know how much I your this.. I didn't know how much I used this until an accident broke it!! I didn't think I needed to replace it until after a week of washing utensils and trying to put them in my caddy...now have a replacement on the way...what a great treat for me!! I can't tell you all how happy I was to be able to get the same one again!! It is a beautiful product that is heavy enough that the cats won't knock it over. Works great in the drying sink to keep utensils separate from other dishes while they dry. Since this is my primary use I have ONE BIG issue. There needs to be a hole in the bottom for this to happen. Water pools in it as I rinse the utensils and put in them. If I don't physically tilt it later to get rid of excess water, they don't completely dry on that in. I have 2 suggestions. One is to design it with that hole in the bottom or redesign it with a slight tilt. Or/and make one for countertop as is and one to function as utensil drainer in the sink. After having mine a few years it broke with an accident with a stoneware coffee cup. I am desperately missing it and am ordering a replacement. I hope the designer reads this as that would solve my issue. I would definitely buy another one to get the drainage! With a big bowl sink I needed something for utensils that are not dishwasher safe to sit on counter. This looks great and adds color to all the grays and whites in my kitchen. This is the second one I bought. The first one was a gift for a friend and she loves it too! I will have many years of use for this product, it not only holds the utensils but drains any excess water. I also plan to give this as a house warming gift.